The integrity of a specimen is affected greatly by its handling during transport. Only use shipping materials supplied by Ascend Clinical. Never place refrigerated specimens directly on ice packs as this can cause hemolysis. 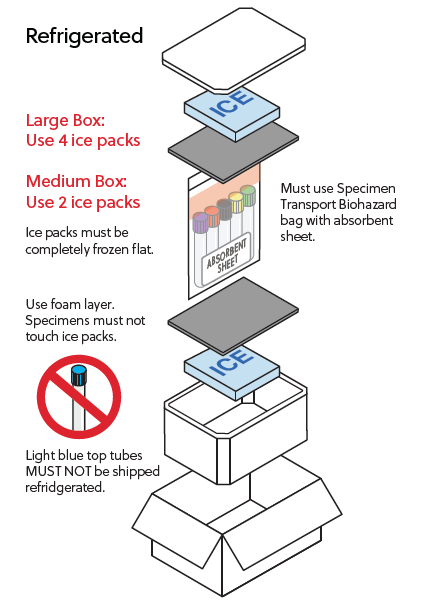 Never ship room temperature specimens in the same box with refrigerated specimens. Temperature requirements for refrigerated specimens are 2° – 8° C (35.6° – 46.4° F). You may ship refrigerated microbiology and environmental specimens in the same box with other refrigerated specimens (such as test tubes) as long as they are bagged separately. All plastic Transport Bags must include an absorbent sheet.